Baked beans are a significant thing in my family. 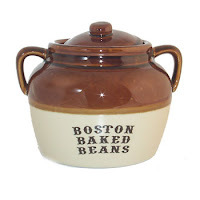 My grandmother was a Morrill, which is the Morrill in the B & M baked beans, and she came from Boston. She always made baked beans on Saturday. Now I haven't carried on that tradition, but we all like baked beans a lot. or bacon diced, cooked, drained. Cook the onions, then add the sausage and cook well and remove excess fat. Add the rest of the ingredients. Taste. You may need to add more pepper, or more mustard, or a dash of Tabasco sauce, or whatever. When it tastes great put into a bean pot and cook in a slow (250-325) oven for about 2 hours. This is great when made a day ahead. On the day you eat it put back in the oven to reheat. The proportions for this recipe are entirely optional. You can make it as big or as little as you like, and you can make the seasoning more or less intense. But if you don't use mustard and Worchestershire sauce it's not the same.